“Designer drugs,” such as bath salts (synthetic cathinones) and spice (synthetic cannabinoids) are manufactured to chemically resemble illicit drugs but can often be purchased legally because manufacturers continually modify their chemical structures in order to circumvent drug laws. Used for their cocaine- or marijuana-like effects, these designer drugs have been associated with dangerous outcomes, including death. A recent symposium reviewed what is known about the way designer drugs affect the brain. 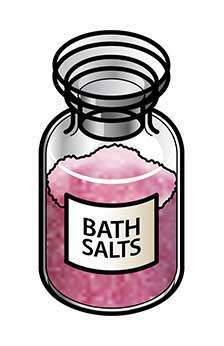 Bath salts can include one or a combination of synthetic cathinones. These chemicals act on transporters for the neurotransmitters dopamine, serotonin and norepinephrine; cocaine, ecstasy, and amphetamines produce their psychoactive effects through these same transporters. Similarly, the synthetic cannabinoids mimic marijuana by activating the same cannabinoid receptors as THC (tetrahydrocannabinol) the main psychoactive component in marijuana. Animal studies have shown that both classes of designer drugs also cause behavioral effects that resemble the drugs of abuse whose mechanisms they share. However, slight differences in chemical structure do cause some different effects. The cathinone MDPV acts on the dopamine transporter 50 times more strongly than cocaine. Also, synthetic cannabinoids are shorter-lasting than THC and are metabolized differently, which could increase potential for abuse and for medication interactions and other toxic effects. Further understanding of both expected and unexpected effects of designer drugs will be needed to address their growing availability and to better inform the public of health and safety risks associated with their use.